Before I bought my MakerBot Replicator I recall discussing The Future with some friends of mine. Do we live in The Future? Almost. A little background: my house is old and drafty, and I live in a part of the U.S. that gets really cold in the winter. I work at home and I spend most of my day in an alcove that’s less than 2 meters on a side. It doesn’t make sense to use a forced air system to heat the entire house while I’m tucked away in my hobbit hole all day long, especially since I use a Mac Pro that is, for all intensive porpoises, a space heater. So I’ve decided to wall off the open edge of the alcove with a pair of curtains that have been following us from house to house for the last 5 years. This gives me the opportunity to test one of my early assumptions about 3D printing: I’ll be able to print whatever household thingamajig I need in minutes. Here’s what I’ve come up with at the end of the experiment, but the process took longer than a few minutes. Before I made this bracket set, I went looking for downloadable curtain rod holders. A Thingiverse search on “curtain” gets me three pages of stuff that don’t quite match my situation, although this one would be pretty cool. Point for 3D printing: the phrase “downloadable curtain rod holders” isn’t complete nonsense anymore. I try looking for “closet” instead. Now we’re getting somewhere. There’s this closet rod holder which comes with the description: The inner diameter of the half circle is about 5/8″. Use your math skills to make the perfect mount for your dowel or rod. The bracket’s functional enough, and a big hand to ColinBB for putting it up there on Thingiverse. But the DIY nature of this technology means that the end user may have to tweak the diameter at home to fit their particular application, which is a strike against Living In The Future. There isn’t an off-the-shelf 3D parts bin yet. Yet. I could probably modify ColinBB’s mount to serve my purposes, but the shape’s so simple that it makes more sense to start from scratch. I’ll have more control over the geometry that way, and it’ll be easier to add decorative flourishes. Plus it’ll be fun. 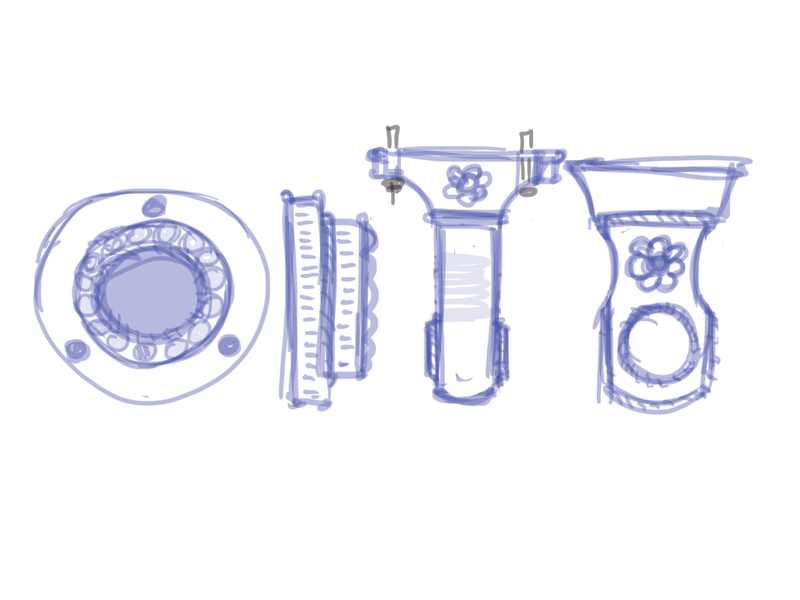 Sketching the object first helps me think through the design in pixels before it becomes vertices. 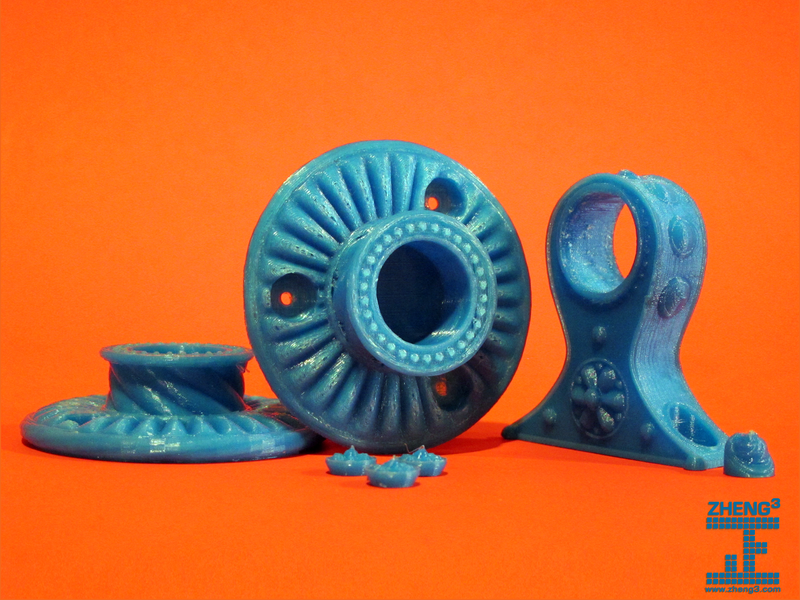 In 3D printing, complexity is free. I can festoon this humble socket with gewgaws and gubbinses and it won’t cost more to make than a plain-Jane bracket. A little more time, maybe, but that’s robot time, not human time. I can be off doing something meaningful while the MakerBot cranks away on printing plastic details. The braided rope is a subtle visual cue connecting the two objects. The hanging rod goes wherever there’s a braided loop. The florets are completely unnecessary on the hanger, but they look nice. Who doesn’t love a floret? I got some PVC at the hardware store– it’s going to be covered by curtains so appearance isn’t a factor here. It’s around 27 cents a linear foot. Total cost, including taxes and two packs of chewing gum to placate the kids waiting in the car: Two dollars, 79 cents. I printed it in blue PLA and then spray-painted it black, then attached it to the wall with drywall screws. If there’s a home improvement project that can’t be done with drywall screws I haven’t found it yet. 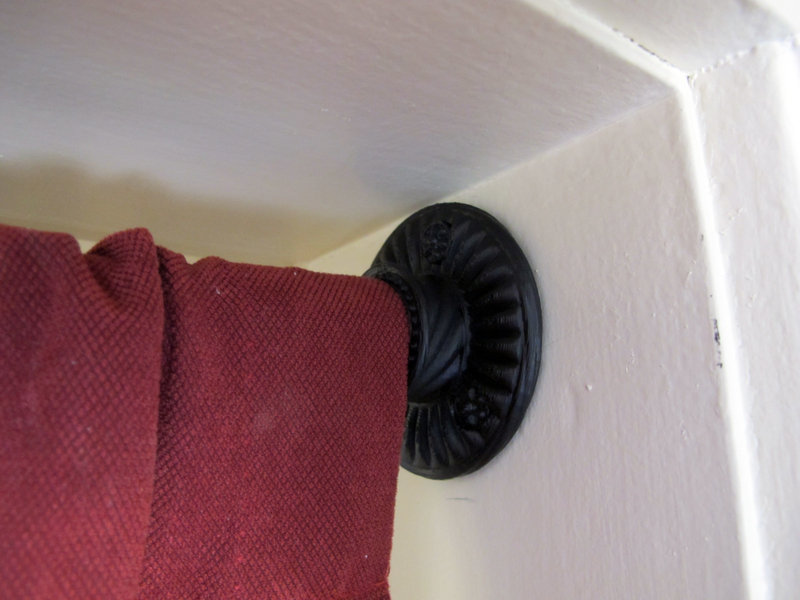 Point against 3D printing: you can’t print your own drywall screws at home yet. All told I’ve got maybe 10, 12 hours worth of design and testing in this object. It would have been much easier and cheaper to go down to the hardware store to pick up a closet rod bracket, but I’m not complaining. This process was a lot of fun, and when the state of home 3D printing advances I’ll be able to print this bracket again at higher resolution. Download it here from Thingiverse. This entry was posted in 3D Printing on November 8, 2012 by zheng3. That looks magnificent. Nice work! Is there any particular type of paint you’ve found works especially well on PLA? Any differences between PLA and ABS painting? I think you’ve said before, but I’ve forgotten: in what software do you model? Thanks! I haven’t seen any difference between spray painting ABS and PLA, and I’m just using cheap off-the-shelf spray paint. I’m using Maya for my design work.